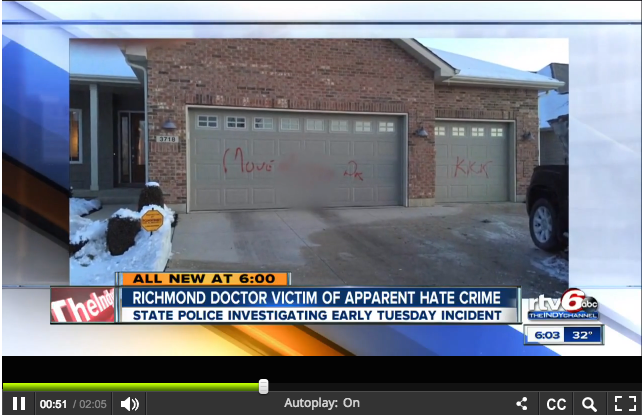 This week, a family in the Richmond community was the target of what appears to be a racially motivated hate crime. Coverage here and here. It’s a horrible thing on so many levels. The psychological assault and intimidation directed at the family. The endangering of lives and the violent destruction of personal property at someone’s home. The use of language so unambiguously intended to demean and dehumanize. The echoes of our country’s not-so-distant past when anonymously burning things in someone’s front yard was a regular practice for racists wanting to instill fear. The further danger is that we treat this as an isolated incident, a single crime to be solved so that we can go back to hoping and pretending that there isn’t discrimination in our community. We’re at risk of only looking for the reasons that this hate crime happened, instead of trying to understand why the hate exists and why all hate crimes happen. So, what can we do to make sure some good comes from such a contemptible act? People in our city can stand next to this family and say out loud that in the face of such hate, we will not look the other way. We can make sure we don’t stand at a distance hoping “the black community” recovers okay. Educators in our community can confront this event head on in the classroom and in other settings. We can talk to our children about what happened, why it might have happened, what it means. We can help them see not only the pain and horror of it, but also the ways in which our society has in the past allowed it, even encouraged it. We can talk about how racism works in the world, and how it works in each of us. We can lobby our community leaders to be publicly involved in working against hate and discrimination in our community. Instead of pretending that human rights violations don’t occur or can be addressed through distant bureaucratic processes, elected officials, law enforcement officers and other influencers can be directly involved in working toward long-term solutions to these issues. And there’s so much more. Few of these things are easy, all of them are essential. Is racism a widespread problem in Richmond, Indiana? We hope not, but racism takes many forms. Nationally known author/lawyer/civil rights advocate Michelle Alexander recently spoke at an event here about how, post-slavery, our country has rebuilt systems of oppression that may no longer explicitly look racist, but that indeed consistently weave discrimination, exclusion and contempt into everyday existence for many people based on their race or ethnicity. If we care about ending hate crimes, we cannot simply hope those systems dismantle themselves. The family that was targeted this week has a lot of recovering, processing, grieving, and rebuilding to do. We can send them our prayers, thoughts and care in the midst of that. But we can also help them and our community at large by beginning or continuing our own work to understand this event and what part we may have played in it. Update on August 21, 2015: it turns out this event may have been a case of insurance fraud or mental illness, and there are still lots of unanswered questions.